The squad-based shooter challenges players to complete a variety of missions to defeat a series of enemy aliens or "exos". In the far future, mankind has partially colonised the planet and players take on the role of a "freelancer" who seeks to help the colonies survive and prosper. Each freelancer wears a javelin exosuit that lets them fly, and holds the weapons and other gear used to fight the aggressive exos. 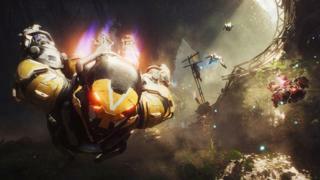 Zachary Beaudoin, an associate producer at BioWare, who worked on Anthem, said the game's six-year development effort had sought to make the title stand out. "It's for players who are looking for a strong social experience, who also want to be part of a greater story they get to be the hero of," he told the BBC. Mr Beaudoin said the game had "challenging" encounters that players would need to prepare carefully for, by equipping their javelin suit with a huge variety of upgrades and weapons. It also had a "compelling" background story that players could explore. "We want it to be a social game with players to tell stories and experiences over a longer period of time," he said. "It's not just launch and here you go." Game industry analyst Steve Bailey, from IHS Markit, said "Anthem is launching into a competitive landscape of unprecedented intensity. "Never have there been so many large-scale, live-operation action games vying for player attention across console and PC," he said. Mr Bailey added that success in the form of a significant and dedicated player-base would be "hard won". "Anthem looks beautiful, its javelins are all fun to fly, and the fundamentals of its combat and character building are solid," said Richard Scott-Jones from the PCGamesN review site. "But there's little variety in its gameplay or mission design, which makes its campaign feel like a chore," he told the BBC. "Its endgame is based on repeating that chore on higher difficulties, which I doubt will keep a broad audience engaged for the long term." "Hooking interest with a strong first impression is critical - Apex Legends has pulled it off - and Anthem is already looking shaky on this point," he said.